This doesn't make any sense to me, because the nuclear reactor would have to be situated at the center. All the designs are consistent with this. So that means that hot coolant flows out and cold coolant flows back in. Doesn't this mean that you'll be fighting natural circulation? If the hot coolant is less dense than the cold, then there's a driving force in the reverse direction of flow due to the centripetal force being stronger on the cold fluid than on the hot. Given that, why do any of these designs propose to rotate in the first place? For natural circulation, the reactor is in the wrong place. So what was ever the logic behind that? Is the idea to use some exotic fluid that decreases density with rising temperature, or is there some other motivation? The only reason for it that is explained elsewhere and I can find is in the first link that you give, and suggests that the rotation creates centrifugal force for the silicon oil coolant to be drawn through the "umbrella" radiator from two feed pipes rotating around the inner edge and moving it towards the radiator's outer edge. creating electricity for ion drive. (4) Hot silicon leaves turbine and enters (5) radiator feed ring. where all the cool oil is (10) sent back to the reactor to start the cycle again. 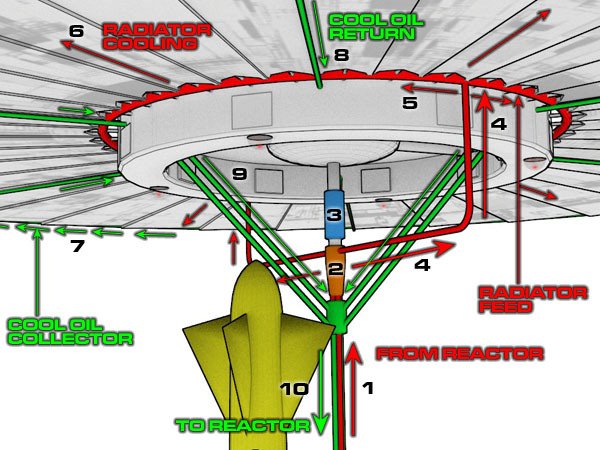 Interestingly though, rotation of the habitat ring and the radiator umbrella isn't mentioned in Walt Disney's Mars and Beyond (YouTube video) and the umbrella ships aren't animated to rotate their radiator part either, merely that the hot coolant exiting the nuclear reactor rotates the generator that produces electricity for the ion drive. So to me, it doesn't seem there would be any point in rotating the umbrella even if that would help distribute the coolant (there are other, simpler ways of achieving that, and you already mention circulation of it through convective heat transfer, which does seem should do the job), especially since all these drawings and animations include an auxiliary landing vehicle mounted on the thrust chamber assembly, that would shift the center of mass off the axis the umbrella part would rotate, making the whole system rotationally unstable and introduce a wobble. For example, even if this is solved by counterweights, it unnecessarily adds weight to the whole system, and it doesn't explain what happens when the auxiliary mounted landing ship departs and ascent stage later docks with the umbrella ship either. Frankly, all of it seems way too complicated, at least how it is explained in sources claiming the umbrella radiator and the habitat ring to rotate, all of it merely to gain centrifugal force equal to 0.05 g (roughly 1.5 revolutions per minute) and radially distribute coolant along its surface, and it still doesn't answer questions regarding system's stability when some of this mass is detached from it or later (less than we started with) reattached. Odd indeed. Not the answer you're looking for? Browse other questions tagged thermal rotation or ask your own question. What is “forward rotation” of a spacecraft? Why is Uranus's rotation 98° to its orbital plane? wouldn't adding mass to Mars be problematic for its rotation as well as other planets? Does Jupiter's high rotation speed affect its gravitational strength at the surface? How to calculate the speed of rotation of a given point on the Earth's WGS84 ellipsoid, about its axis? How much does the rotation of the Earth affect re-entry and could we go against it?